Students ended the full-day tournament with a winning record. On Saturday, Feb. 2 the USN Quiz Bowl Team went to Vanderbilt University for a tournament. After a grueling morning of seven straight matches, the 5-2 record put the team at the top of the B bracket. The team then won two of three matches and ended the day 7-3. Congratulations to Charlie Lamb ’19, Evan Rork ’19, team captain Elliott Clark ’19, Emily Wykoff ’22, Daniel Borza ’21, Ben Gregg ’21, and Ethan Li ’21. 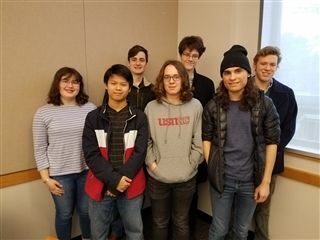 Quiz Bowl Team members Emily Wykoff ’22, Ethan Li ’21, Evan Rork ’19, Ben Gregg ’21, Charlie Lamb ’19, Daniel Borza ’21, and team captain Elliott Clark ’19.